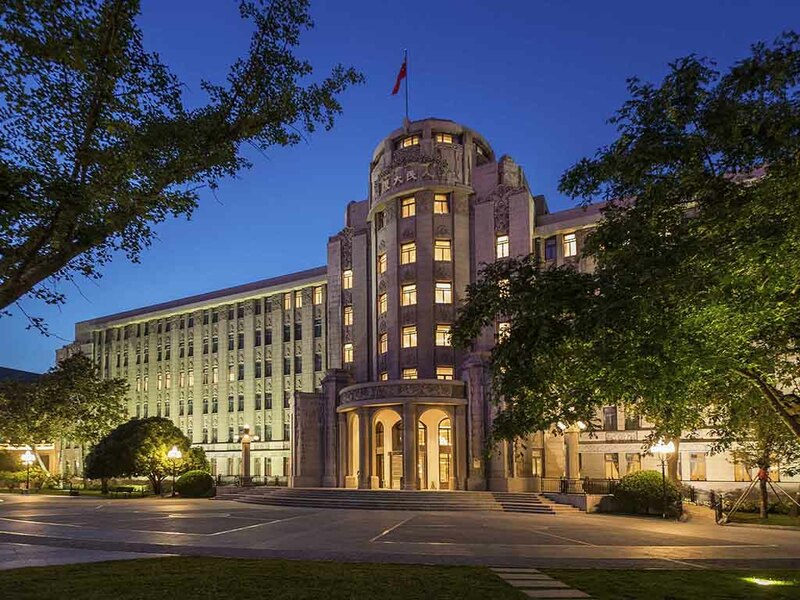 Originally established in 1953, the legendary Xian People's Hotel embraced in a beautiful landscaped garden and located right in the heart of Xi'an is being completely refurbished into an ultra luxury hotel. Reopened in 2014, Sofitel Legend People's Grand Hotel Xian features Italian restaurant, bars, spa and state of the art facilities. The hotel is only 45 minutes to airport and 1 hour to Terracotta Warriors Museum, and is within walking distance to many famous historical sites. 44 luxurious rooms and 27 palatial suites, majordome service, Sofitel MyBed, pillow menu, coffee maker, unlimited WiFi, high technology and luxurious bathroom, walk-in shower, stand alone bath, mirror TV, LANVIN amenities, silk bathrobes and kimonos. Legendary Venetian traveller Marco Polo would have appreciated Dolce Vita restaurant which serves authentic Italian fare for lunch and dinner. A wood-fired pizza oven, open kitchen and elegantly presented antipasti table are special features. Its comfortable residential feel makes 1953 Lobby Lounge a comfortable and elegant gathering place for cocktails or afternoon tea, Asian and Western favourites and light snacks. Beautiful hotel. Room was spacious and lovely. Bathroom large, great shower and tub. Bed very comfortable. Luxury throughout! Visiting Xi An is a must but staying at the Sofitel is a double must. Extremely well located, impeccable service, good food, lovely happy hour. A beautiful hotel and very comfortable room. Very charming staff . Our only criticism was the Italian Restaurant was extremely cold. From the moment we entered the hotel, we were met with a very professional, friendly and service oriented staff. They upgraded our room and were more than helpful showing us around the hotel to make sure we were comfortable. The restaurant was also excellent in terms of food and service. Overall our stay was amazing! I was extremely satisfied. I got a warm welcome, experienced a fast and easy check-in, got a nice room and the staff was very friendly. Already looking forward to my next stay. It was wonderful. Staff was attentive. Remembered my name, made the experience very warm. But there were a few things I could recommend. The bed was a bit hard, wish there was a softer bed. And strangely, there was no hot water past 10pm. The water was warm, but not hot. It would come back in the morning though. I found that strange. This trip was to celebrate our 30th anniversary, the staff at the hotel made our stay memorable. The hotel rooms and grounds are beautiful however it is the people that make the People’s Grand Sofitel special. They touched our hearts. I like the room and tks 4 the service ! I have stayed at this hotel for two wonderful nights I liked the design of the rooms and the hotel and its enclosures in general and I was pleased to welcome the staff and I was pleased with the way they treat me without hesitation and I recommend visiting this legendary hotel in every sense of the word. Attentive staff, quiet hotel. Walkable to the Drum Tower, Bell Tower and Muslim Quarter. We had a nice room. It was a pleasant experience from check in to check out. The staff were well trained and helpful. The rooms are grand and luxurious and the facilities in the hotel is world class. The musuem is interesting and the gym facilities are good. The breakfast spread is excellent and the happy hour experience is also great. The selection of drinks and food at happy hour is excellent. We stayed 3 nights in a Premium Room. The room was spacious and well thought-out with good interior detailing and the finishes are decent. Lanvin amenities, evian bottled water, nightly turn-down service and the very comfy bedroom slippers and evening cocktails in the lobby bar were a nice touch. Room facilities, like ample charging ports, were well thought-out. The only qualm I have was the light from the touch panels by the bedside. Although the lights were all off, there is still too much light glowing from the touch panels and we couldn't figure out if it could be turned off. CUSTOMER SERVICE ACCOLADES & IMPROVEMENT =========================================== The lady who checked us in on the first day (26/12/18) was professional and nice. So was the tall, older gentleman at the concierge, he had a genuine and kind smile which was always a welcome. We would also like to thank the gentleman who brought us our luggage and who gave us advice (contrary to the the check-in desk's advice) to take a cab instead of the metro to the North Xi'an Station. He even arranged a taxi for us at 7am and ensure we were on time to the station. This is THE WAY in terms of customer service, looking to service from the perspective of the guests and anticipating their needs. We had stayed 3 nights at Shangri-La prior to staying at the Sofitel Legend. The marked difference in service, we felt, was the sincerity of the staff. Most of the staff in the Shangri-La had an attitude that really shone through in their smiles and the way they interact with us – very personable, warm and they always treated us like old friends. Although the staff in the Sofitel Legend were competent, professional and attentive, we often feel uncomfortable when they approach or greet us, as it felt very official and stoic; and their awkwardness in trying to do their best was obvious. MINI BAR SNAFU =============== Although the mini-bar was free, we were informed that it was only for the first consumption (despite the number of nights we stayed), if items were consumed after replenishment, they will be charged accordingly. This was a tad odd. It's a small amount so we didn't really care, but considering we booked it for 3 nights, we would have expected the mini-bar to be refreshed for free daily. Anyway, wasn't that much of a big deal but it was more a matter of principle. SWIMMING POOL/GYM CHANGING ROOM/LOCKER ============================================ For a hotel of this calibre, we were surprised to find that there was no changing room or locker room for the gym or swimming pool. The facilities were side by side. Although the gym facilities were ok, it was small and definitely not big enough during peak periods. It seemed like it was added on as an after thought. For the swimming pool, we were eager to take a dip BUT realised there wasn't any changing room for us to get out of our wet swimwear. This would mean that after taking a swim, we couldn't change out of our wet trunks, had to walk pass the main lobby to get back to our room, leaving a trail of pool water. We didn't fancy wearing a robe down as well as there was no separate access to the gym except via the main lobby lifts. So we decided NOT to swim, which was a pity as the pool looked great! This is definitely a design oversight with regards to a luxury hotel experience. we don't think much can be done considering it was transformed from a government office to a hotel. All in all, it was nice to have experienced this hotel, to wander in the hotel's museum and marvel at its role in history since it was built in the 50s. It being one of the 5 Sofitel Legends in the world, it would be great if it could truly live up to its potential. I enjoyed myself completely. The staff took great care of us & all with a smile! I travel frequently and cannot remember a more pleasurable stay. The hotel is a beautiful, historic building and is incredibly well appointed. Most memorable though were the staff - everyone I dealt with went out of their way to make my stay a wonderful one. They were so kind and helpful - a credit to the hotel and themselves. The hotel was beautiful and the room was very nice, but the temperature of the hotel and the inability to properly control the temperature of the room was beyond irritating. The food in the restaurant was quite good. It was our honeymoon trio and Lizzy made sure that the room was prepared for us accordingly. Flowers, cake, minibar and champagne on arrival. The staff was very friendly and helpful too. The stay was really enjoyable.